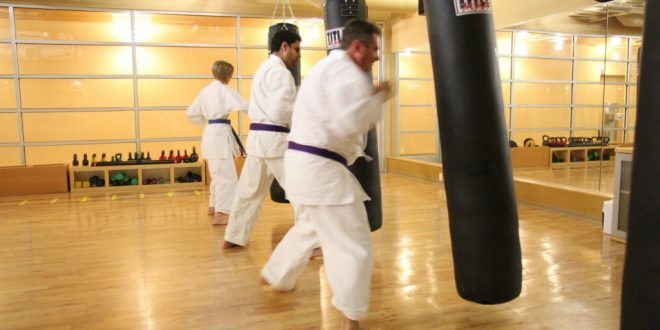 If you practice martial arts like boxing, mixed martial arts (MMA), karate, or some other disciplines as well, punching bag must be an essential part of your exercise routine. If you are a beginner in martial arts you will need to collect some key information about punching bags, or training bags, before you decide on buying one. You can find websites that review all kinds of fighting gear in help of the buyers. In this article, we will be discussing the types of punching bags and how to choose the right one for you. The more experienced an athlete is, the heavier training bag they need. If you are a beginner 50-70 pound bag can be okay for you. Heavier bags are used by advanced sportsmen with more experience. In general, professionals recommend using punching bags which is approximately half of your body weight. E.g. if you weight 150 pounds, 70-80 pounds bag can be a good choice. Be careful: overweight punching bag can cause injuries. The outer material of the bag is very important since it determines how durable a bag will be and how will it serve you. Tough material is good for it, like leather or heavy-duty vinyl. How to decide between hanging a heavy bag and a standing one? They both have their pros and cons. A hanging bag is better in doing speed and timing exercises because it moves and imitates the real opponent. Also, it is great for your feet movement. Standing punching bags are easier to transport and move, but they are softer and give a different striking experience. Hanging bags normally cost less than standing bags. Heavy bags differ a lot according to the material they are filled with. There are several major materials used to fill the punching bags – fiber, sand, even water. Each of them creates different feeling while hitting. For the beginners softer bags are recommended, while pro fighters use heavier and tougher ones. Try to choose the bag which feels the most comfortable to punch. But what are the benefits of choosing the right punching bag? How can it speed up my progress as an athlete? Here are some examples of a positive impact it makes on your training. Toning your muscles – Punching a bag is an intensive exercise. Try to do it every day and soon you will see how your muscles become stronger and toned. A good cardio exercise – One of the best methods to exercise your heart and breathing. The heart rate of an athlete can reach up to 200 beats per minute during an intensive punching bag training session. Balancing your weight – Controlling your weight is very important if you take a martial art seriously. Punching bag exercise is brilliant for losing 1-2 extra pounds before a competition. 30 minutes intensive training on a punching bag can burn up to 400 kilocalories. Improving your speed and feet movement – Sparring or competing with a real opponent is a nice experience of course, but when training alone you can practice your skills and techniques on a good old punching bag. As a conclusion, we can say that a punching bag is an irreplaceable piece of sporting equipment for athletes practicing almost any kind of martial arts. We recommend to carefully research and choose one before purchasing. Make sure that you read some reviews online and see if the people are satisfied with the product. Next: What can you do with a business degree?